PomRescue.com inc » Just what is a Pom rescuer anyway? 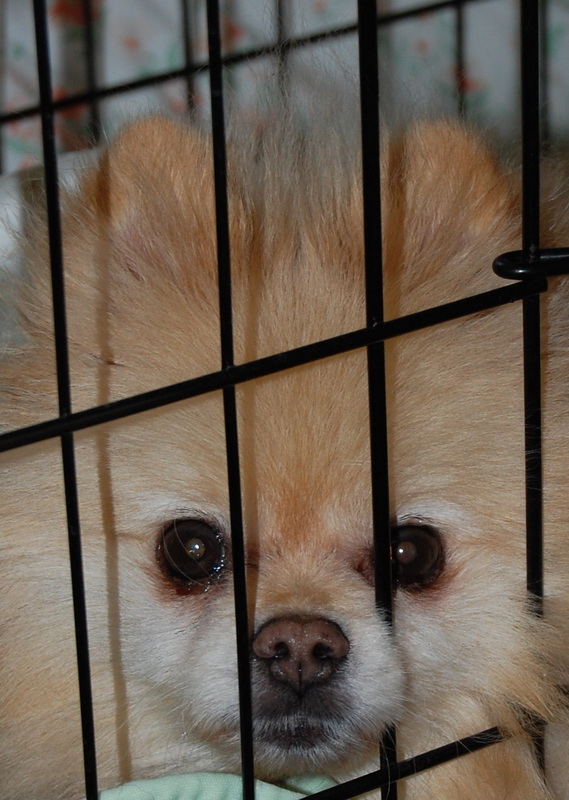 What is a Pom rescuer? God has a sense of humor. Of all the things I thought I would be doing at this stage of my life, I would never have guessed I would be a full time POMERANIAN rescuer. I have to chuckle at the looks people give me, when they see my PomRescue.com T shirt or I mention what fills my life 24/7. Why couldn’t it at least be a breed that doesn’t conjure up pictures in the mind of orange, fuzzy, cartoon like, ‘foo foo dogs’? I mean- I have had German Shepherds my whole life! Think how noble one is to rescue German Shepherds. Or Goldens. Or Labs. etc etc. One can be taken seriously. But Pomeranians? I frequently am asked by people with bewildered looks, “Do Pomeranians need rescue?” Then the door is opened for me to explain that not all Pomeranians are loved, cute, and sit on a pillow all day. Oh how I wish that were true! My computer hard drive is filled with images of the old, blind, deaf, sick, neglected and abused. Every day I sort through hundreds of emails that read like this: ‘Urgent! Last day!’ and ‘Senior Pom dumped at kill shelter after owner dies’, then ‘Blind Pom in animal control, only has until tomorrow’, and ‘Puppymill Poms in humane society need rescues today, they are out of room- PTS tomorrow!’ (PTS is the abbreviated way of saying put to sleep)All are urgent. All are worthy. All need rescue. That is where I come in. I get the call, or read the email. I have to make the heart calls. Who can I help? Who is beyond my help? Do we have room? Do we have the money to care for the dog when we get it? The adrenalin starts pumping. I send off a quick responses. Telling them to hang on, to pack their bags, I am coming. 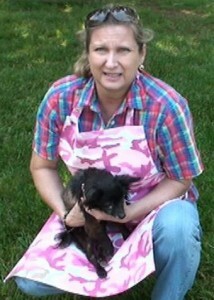 I pull on the silly PomRescue.com Tshirt and slip my feet in to my old bleachable ’shelter shoes’. I call one of my sisters or my husband and ask if they want to ride ’shot gun’. Most times they do, but sometimes it is just me and TomTom(navigational system). I load the car with cameras, crates, towels, Capstar(for fleas) leashes, emergency Nutrical, food, water and paperwork. When I look at my hands they clenched in to fists as if I am going to do battle. I have to shake the tension from my shoulders. This is going to be a long day……. 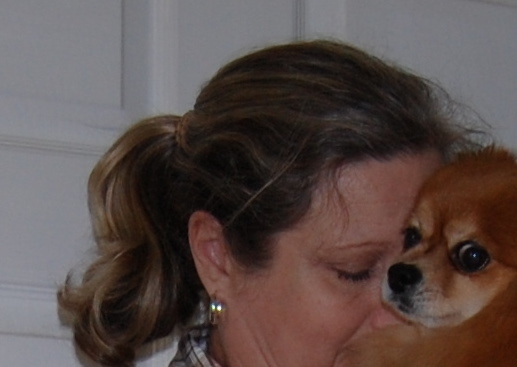 After I get the call or email, and make the decision that we can rescue the needy Pom- I am a bundle of energy until I get the dog safe back home. Experience has shown me that there are just so many things that can happen between the time I get the information and the time I hold the pupper in my arms. 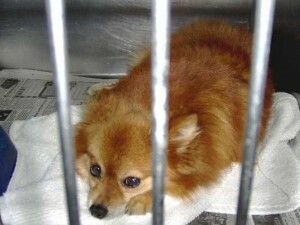 To explain a little further, Poms do TERRIBLY in a shelter environment. Because of their small size, many times they will get backed in to a corner of the cage or kennel and when the worker goes to reach for them – they may try to defend themselves. A growl, a lifted lip, or (Heaven forbid) a bite, can mean the dog is put to sleep. The shelters do not want to assume liability for a dangerous dog. Many times I have been asked to go back and get the dog out of the kennel as the workers do not want to have to deal with them. I take a heavy towel and drape it over the head of the dog and then lift it up. When I am standing upright again, I can then just drop the towel off of their head and wrap them in it for security. Often they have sat in a steel cage or crate with out being taken out to go to the bathroom, so they are soaked in urine, and poop is stuck to their hindquarters. 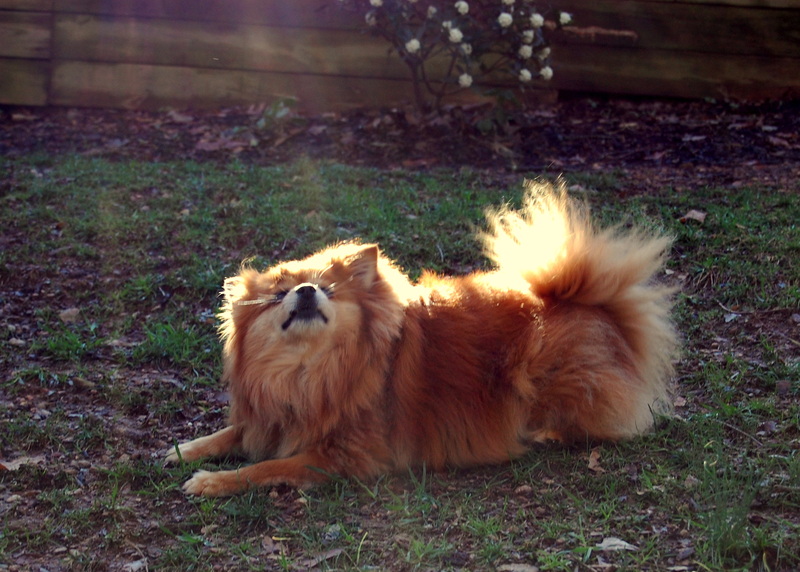 The fluffy skirts of a Pom are really bad to cause the mess to stick to them. On one shelter pick up, I had to pull over and stop at a Dollar store to buy a pair of scissors, cleaning gloves, paper towels & air freshener for the car. I actually had to cut the mess off the poor Pom in the parking lot, just so we could stand to ride in the car. I cannot imagine how he stood it for so long! Now I carry paper towels, scissors & gloves on all my shelter runs. 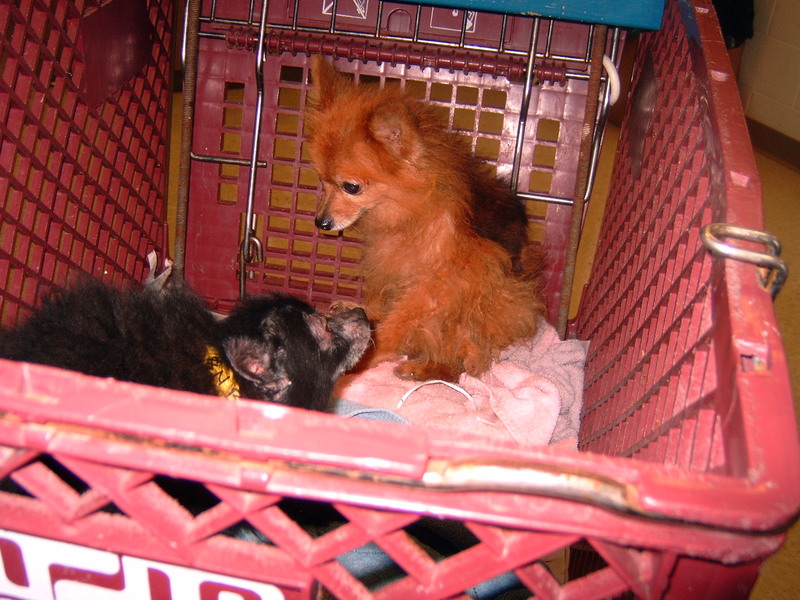 Because the Poms do so badly in the shelters, they may not have eaten or drank water in a long time. I had one little Pom boy(remember Moppet?) actually flop his head over on my arm and pass out as I was walking out to the animal control parking lot. I thought it was too late for him. He was in horrid condition. Nothing but bones and smell. Thankfully I have learned to carry Nutrical and Nutridrops in the car so I was able to revive him pretty quick. That was a close call. When I first walk in to a shelter, I stand in front of a counter and wait for someone to help me. Often the waiting area for rescue pick ups is in the receiving area for people to leave their pets. So many times I have been scarred by watching the thoughtless, ignorant and uncaring way that people turn in their faithful animals. These are the same animals that would run in to a burning building, or jump off a cliff after them. The dogs just trustingly walk by their owners side as they are handed over, sometimes to a certain death. Even after the employee tells them in no uncertain terms that the animal they are leaving will most likely be put to sleep(PTS) because they have no room and are over crowded. Owner turn ins (OTI) have the least time in a shelter before they are PTS. Strays may be held a little longer to give the owners a chance to find them. The very worst I can remember was a lovely silver haired lady that looked like someone’s Grandmother. She walked in with an immaculate tri-color Beagle. I was amazed at how white his white was. He was older and a lot of that white was around his muzzle. I knew before the shelter employee said a word, that this old, trusting boy didn’t have a chance. The owner signed the document and walked out with out a second glance. No! I wanted to scream. You can’t do this to him! Don’t you know what is going to happen to an old dog in an already crowded shelter!? She knew.The shelter employee had explained it to her. And she left him anyway. There was nothing I could do but add another scar to my collection. “I am PomRescue.com. I am here for the Pom”. The employee – disgusted with the last transaction – looks at me with a bit of incredulance, almost like she is having trouble understanding the words I said, and walks to the back. It is time for our little miracle to begin. I am a Pom rescuer and this is what I do. The animal shelter worker comes back out and hands the Pom across the counter. Usually they are shivering and shaking – scared to death. Most of the time the dog looks nothing like what I could make out of the tiny poor quality picture I was sent. I don’t have high expectations. If the dog was young and cute and fluffy, they would not need rescue.They would be adopted on the spot. I always bring a towel so I can bundle them up and help them to feel safe, not to mention to keep my shirt from becoming stinky for the ride home. 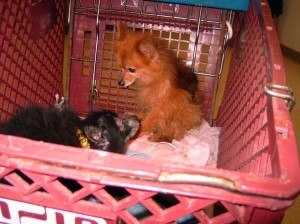 After re-assuring the Pom for a while I put them him inside my crate and ask the shelter employee if I can leave the Pom behind the counter as I do a walk through. Most of the time this is not a problem. This is when I transition in to a ’shelter walker’. I take my video and still cameras and walk the rows and rows of kennels and cages, taking pics, videos and gathering as much information as I can about each dog. I pet, and talk to each one and try to remember as much as I can. There was a elderly German Shepherd(GSD), an energetic Akita, a white Spitz, a large black Lab, a senior Jack Russel(JRT) and the list goes on. When I get home I will take the pics, info & videos and send out emails on each dog to the breed rescues, general rescues, and regional rescues, as well as posting on Facebook. Some times that little extra bit of exposure is just what the dog needs to get a rescue group interested in coming for him. After I am finished with the walk through, I promise myself I will do all I can for the ones I have left behind and I go back up front to retrieve our little rescue. One little dog. It is not much, but it is much to that one little dog. I feel a warm glow inside as I pick up the crate, go through the doors and walk out in to the fresh air. It feels so good to be outside. You just cannot imagine how good the air smells when you leave a shelter. I can’t wait to get home and get our dog in the sink to get him all clean! At the car I take the canned food I have brought, break open a Capstar and feed it to the Pup. This kills the fleas before we get home. I learned the hard way that a drowning flea can easily jump from a soapy wet nose to the closest dry object….usually me! Then I offer a drink of water and a little walk about to stretch their legs and let them go to the bathroom. We have already started bonding at this point. I have become their provider and protector, thus I am their leader. It is almost mystical how this happens. It is like there is a silken thread is woven from their heart to mine and we will always be connected in some way – even long after they have gone to live with their forever families. As I drive home my mind wanders back to past rescues. Once there was a whole Pom family turned in. A teenage daughter had been given a gift of an unspayed female Pom. She thought it would be fun to have puppies. After the fun wore off, the puppies were left to fend for themselves in the back yard. Tired of feeding them, the father of the girl loaded the Mother Pom and the three near feral, almost adult puppies(Stormy, Thunder & Bailey) up and left them at the shelter. They were a matted, nasty, wild mess. That day I brought four rescues home. Then the very worst came to mind. It was when the shelter employees at our local humane society rolled the two Poms I was to rescue out to me in a grocery cart with a wooden lid on it. They did not even want to touch them. They were Coal and Baxter. Their skin looked like it had a life of its own as it literally crawled with fleas. They were being eaten alive. I still don’t understand why some one didn’t give them something to kill the fleas and relieve their suffering. They had dread locks of fur just hanging off of them. They were so malnourished you could see their hip bones and count their sunken in ribs. Supposedly the owners had left them saying they were moving and could not take them. From what I could surmise, these dogs must have been left in crates for weeks with out food. They had no muscle tone at all and had pressure sores everywhere. I remember the feeling of blazing red hot anger rushing to my head. I wanted to hurt somebody and hurt them badly. If I could have gotten my hands on the people that did this to them, I would have had no mercy. That was in the early days of rescue. I try not to waste too much energy on anger anymore. If it helps then I can get angry, but most of the time it zaps me of the energy I need to help heal the ones that are hurt by mans stupidity and lack of compassion. I don’t have the time to stay angry. Now I get pupdates and pictures regularly from Baxter’s family, and I smile every time I think of him and how spoiled he is. Coal had a wonderful home too, but sadly, crossed over a few years ago. So many little fuzzbutts over the years……..
My stomach growls and I realize it is time to stop for a chicken sandwich. I roll through the drive through before sharing my meal, the first of many, with our new rescue. The time for spoiling has begun. Not all of our rescues have come from shelters. There was the occasional owner surrender(OS) although we can now only accept those in a shelter in danger of euthanization. Several years ago I received a call one day from a man that asked me to meet him at a local grocery store parking lot. He said that he had his daughter’s Pom and it was mean. “If I didn’t come get it, they were going to shoot it.” This was not going to be the last time that I heard that phrase! I jumped in the car with my crate and as I pulled in the parking lot of the store, I saw that there was a man standing by a truck dangling a medium size black Pom by a leash. The man’s arm was bleeding & the dog tongue was turning blue as it was about to pass out. When I went to reach for the dog, he told me to open the crate, and he turned it with the back side to the ground and lowered the dog in by the leash. With that, he said,‘Good luck!”, jumped in his truck and was gone! “Oh heck. What have I gotten myself in to this time?” I mumbled to myself. The dog’s muzzle was swollen and he was a bit thin and head shy. At first I had to handle him wearing a padded jacket and welders gloves. He would turn on me and bite like his life depended on it. I read every article I could find on dog aggression and consulted my friend Christy who has been rescuing since she was just a kid. In a few weeks he acted like every other Pom. He had been allowed to get away with aggression and had appointed himself the Grand Poobah. Once he learned who the leader really was, he was relieved and allowed himself to relax and follow. A few weeks at Christy’s boot camp for wayward dogs and he was ready for his forever home. The next OS that I can remember was a man that called and asked me to meet him as he had his father-in-law’s Pomeranian. It had been kept in an out door pen under the trailer window. The dog was barking & keeping his father in law awake and “If I didn’t come get it, they were going to shoot it.” (see what I mean?) Not having any idea what to expect, I was amazed when I saw a little smiling cream sable Pom boy. He needed grooming and vetting but he was one of the sweetest dogs we have ever rescued. All he wanted was to be in with his people. He was adopted by a lovely couple on a nice gentleman’s farm in the next county. The most recent owner surrender began by a call from a local animal control shelter. They said a young couple with a baby came by and was going to leave a mother Pom and her three puppies but the shelter manager told them that there had been Parvo there and their chances of making it out alive were slim to none. So she called me and asked would I meet them at a gas station. I drove the 20 miles not knowing what I was getting in to. As they pulled their big truck in beside me in the parking lot, I noticed the young couple could not have been more than 22 years old. Just babies themselves, with a baby. They even looked hungry. I found myself wishing that I had brought some cash to have given them. The little orange Pom mother was so thin. The biggest thing about her was her worried dark eyes. The puppies were no more than a few weeks old and totally dependent on their mother. When I asked what they had been eating, the kids said “Cat food. That is all we had”. Heaven help them where ever they are now. They were trying to make it. I pray they did. I named the scraggly little Pom mother, Mollie. I set up a puppy pen for them and a chair for Mollie to jump onto when she needed a break. After that I gave them a plate of some moistened dog food. I had to refill the dish three times before they were through eating that first meal! They were all four ravenous. Next I jumped back in the car and headed for the farm supply store for some quality puppy food, puppy wormer and 4 puppy vaccines. After their worming the poor dogs weighed even less, so riddled with parasites they were! The puppies grew healthy and strong. What fun it was having their puppy playfulness and innocence to enjoy! Eventually Snickers, BayLee and Cola were adopted out to good homes. I hear from them often and they make me smile. As for Mollie, Mollie adopted me. She seemed to think I needed looking after. She has appointed herself as my therapy dog, and will warn me of upcoming Fibromyalgia attacks and migraines. When my husband wants to know how I am feeling, he has learned to look at Mollie. She is an excellent indicator and seems to know me better than I know myself. She is totally the boss, and often she communicates to me that she is a Pomeranian rescuer of Pom rescuers and that is what she does! Just what exactly is an Animal Shelter? The words animal shelter evoke warm fuzzy feelings of protection, warmth, and safety for the animals. But many shelters are little more than animal impounds, and mass holding and killing facilities. Before some one unloads a cannon on me, let me make it perfectly clear, there are MANY great shelters that are true shelters in every sense of the word. They are staffed with underpaid, hard working, caring animal lovers that will move Heaven and Earth to be ensure that every animal that enters their shelter gets every chance at a long healthy life and a great adoptive home. I love these shelters. I love these employees and volunteers! God bless them. That said, lets get back to the kill shelters. Kill shelters is a term that rescuers use to call the impounds that gas, heart stick, shoot, and euthanize by lethal injections. I often think there should be a mandatory change of titles and signs on the ’kill shelters’. Many use(abuse) the name of ‘humane society’ but most all misuse the name of shelter. 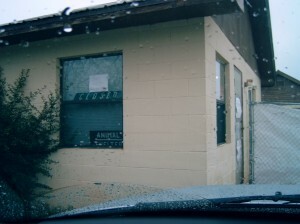 Some call it like it is: animal control impound. Sigh…. I hate to do it but the reader needs to know about what happens in these ’shelters’. Lets start with gassing. Some animals entrapped in gassing shelters may face their last minutes struggling and fighting for air in a stainless steel commercially made gas chamber. If they are lucky they will be separated in crates or cages. If they are not so lucky, the kittens, cats, dogs and puppies will all be shoved in together until the chamber can hold no more and the door is then slammed shut on them. Thus making them fight it out in their last breaths of survival as the gas is pumped in the chamber. Make you think of a certain Holocaust? Yeah, me too. One day, we will look back at our treatment of animals with horror and disgust, and wonder how we ever let this happen. In the poorer areas, some ’shelters’ use a home made gas chamber made of cinder blocks, a door and a rubber hose hooked up to the exhaust of a pickup truck. By the way, it is more coast efficient to execute more animals at one time. Saves having to buy the gas for the truck. Oops. My cynicism seems to have manifested itself here. Lets move on to the heart stick. Yep. It is just as bad as it sounds. In most areas where heart stick is legal, an animal is supposed to be anesthetized before a trained technician jabs the chest with a sharp object in order to stop the heart. It is supposed to be done in a private area away from the other animals and the public. Let me ask you this, a ’shelter’ that is ignorant enough to have chosen to kill its animals in this way is going to be conscientious enough to be sure all the rules listed above are followed, right? I think you already know the answer to that one. Twenty miles from me and a few years ago the animal control employees were taking the dogs right outside of the kennels, in full view of visitors and the other animals, and holding the dogs up by their front legs stabbing them to death in the chest. Volunteers have told me of the animal screams and the blood. Then they were tossed in barrels to be taken to the landfill. Who does something like that? Do you want them living next door to you? These same volunteers got busy and did something about it, but I will save that story for another time. The point is, they did heart sticks barbarically and illegally until someone cared enough to do something about it. The next form of killing. Shooting. In many facilities they consider shooting an animal legal and cost effective. Again, who does this? I mean who can lay down and sleep at night after shooting two dozen dogs and thirty cats? Just this past month rescuers arrived at a shelter to pull the animals they were going to rescue and the cages were empty. Prisoners working at the shelter told them the dogs were trucked away and taken to the landfill to be shot. They also said the AC(animal control) officers were using them for target practice. The rescuers went out took a shovel and uncovered the bodies of dogs that had been shot. Not clean, straight to the head shots, but wounding injuries causing significant bleeding and suffering. Now, see why I have a bad taste for ‘kill shelters? Lastly, there is the lethal injection kill shelters. I know that not all animals can be saved. I know that there is a time to let go and end a sick animals suffering and pain. Lethal injection, in my opinion is the most human way of ending an animals life, when it is done PROPERLY and by trained and compassionate people. The animal may be taken to a serene and private room, where a tranquilizer should be given to help them be relaxed and happy. A technician should help hold and comfort the animal while the other trained technician gives the injection. Then the body may be placed in a freezer, dumpster or cremated. It is really handy for ’shelters’ that do high numbers of kills to have their own in house crematorium. No worries about body counts or landfill fees…. I have just described to you the best case scenario for a lethal injection kill shelter. After enduring the previous three descriptions, I will just allow you to imagine the worst case scenarios and leave it at that. Now what can you do about what you have just read? Start in your own town. Find out what happens in your shelter. Ask for the numbers. The number of animals received. The number of animals adopted. The number of animals killed. You might want to rephrase that and use the words ‘put to sleep’ or ‘euthanized’. Some of the shelters get very offended when you talk about the disposal end of sheltering. I know of one that will not even allow its employees and volunteers to use the words ‘pound’, ‘put to sleep’, or ‘euthanized’. At this same shelter when a person calls to ask about the status of an animal, the employees are instructed to reply, ‘They are no longer here’. Even when the ashes could be out back cooling in the crematorium. Ask the shelter if they work with rescues. Ask how many animals go out to rescues? Ask how long an owner surrender(OS) has before they are euthanized. How long does a stray have? What are the adoption fees? What are the hours open to the public? What are they doing to get the animals exposure and adoptions? Do they post animals on Petfinder.com, one of the countries largest animal adoption sites? Do they post pics and videos of the animals? If not, then why not? Do they need a volunteer and a camera to do this? Before you write your check for a donation, you need answers to all these questions! If the answers are not what you want to hear about a shelter in your area, find out who the board is, and start contacting them. Nothing will change until people unite and start making some noise. If you think all this is too much trouble, just imagine that you came home from work and your dog had gotten out and lost. You forgot to put an address tag on your dog and your collegiate collar and the name tag with Spot on it does nothing to tell the AC officer, who’s dog it is. So he loads the dog up and your dog spends the rest of the day riding around in a box on the truck. That is Day One. The days a stray may have to be claimed may only be three. Day Two your dog is held in a back kennel in holding. Day Three is the last day and it may be Friday and the staff will be leaving earlier so the euthanizations are going to take place in the morning. That way there will be less animals for the staff to come in and take care of over the weekend right? Nobody wants to work on Saturday! You see where I am going with this? If you don’t do something, then who will? The animals depend on us. Lets don’t let them down. This page was posted on Tuesday, March 8th, 2011 at 9:43 pm. You can follow any responses to this entry through the RSS 2.0 feed. Both comments and pings are currently closed.